Which Sound Shark product is right for you? We want to do everything we can to help you get exactly the right products for your needs. The tabs below should help make your decision easy, if not don’t hesitate to contact us. If you would rather choose yourself, the button below the box will show our full product listing. What setup do you need? Each of these kits includes a microphone and a wind cover for your Sound Shark. With a kit you will have everything you need to record great audio. Determine which type of microphone connector your camera, or recorder, requires and click the appropriate image below. You will be taken to the kits with the proper microphones. What type of connector does your camera / recorder have? Are you recording with a DSLR camera? If so, you should consider purchasing a Professional (Pro) kit that includes a preamplifier for your microphone. To help you decide, we have created a series of blogs about when a preamp is required. If your camera, or recorder, has as 2.5mm microphone jack (such as some Fuji cameras) you will need a 3.5mm to 2.5mm adapter. or the 2.5mm version of our Stereo Jack Adapter. Please refer to our Compatibility page for a list of cameras that we believe have 2.5mm jacks. 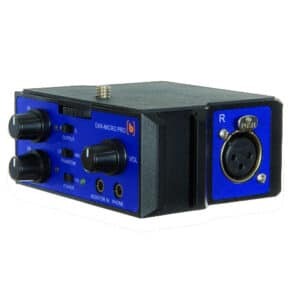 Please refer to our Compatibility page for a list of cameras that have XLR jacks. Each of these kits includes a wireless microphone and a wind cover for your Sound Shark. With a kit you will have everything you need to record great audio. Determine which type of microphone connector your camera, or recorder, requires and click the appropriate image below. You will be taken to the kits with the proper wireless microphones. These kits are provided with a wireless microphone, that connects to devices with a 3.5mm microphone jack, as well as a Wind Cover. If your camera or recorder has as 2.5mm microphone jack, such as the Fuji cameras, you will need a 3.5mm to 2.5mm adapter. Please refer to our Compatibility page for a list of cameras that we believe have 2.5mm jacks. These kits are provided with a wireless microphone, that connects to devices with an XLR microphone jack, as well as a Wind Cover. Please refer to our Compatibility page for a list of cameras that have XLR jacks. This is all you need if you already have a lapel mic – To get started, follow our setup instructions to integrate your existing mic with the Sound Shark parabolic sound collector dish. We have several kits under the “I Need a … Microphone” tabs (above) that include various microphones along with a wind cover for your Sound Shark. The Sound Shark is available with LED lights to add a light source to your audio capture. For a limited time, the Sound Shark is also available with a black finish. Learn more.